At our baptism, God gave us unique talents, interests, abilities and purpose. We are to use these gifts in service to one another, those in need, our broader community and world. If you would like to participate in any of the following ministries, please contact Toni by calling 651.846.9212 or click here to email her. Nursing Home Eucharistic Minister – Bring Eucharist to residents of Sunrise Assisted Living on Tuesdays at 2:00 pm. Serve on a scheduled basis. Funeral Lunch: Worker – Scheduled as needed. Funeral Lunch: Bar Maker – Scheduled as needed. Leisure Center – Help needed to prepare and serve or clean up the weekly home cooked meal offered on Wednesdays to folks 55 years and older. Vocation Committee – Fosters vocations to priesthood, diaconate and religious life. BeFrienders – Visit elderly, home bound, hospitalized and nursing home residents. Listen and share in conversation. Training and support provided. Prayer Chain Ministry – Pray for the needs of others. 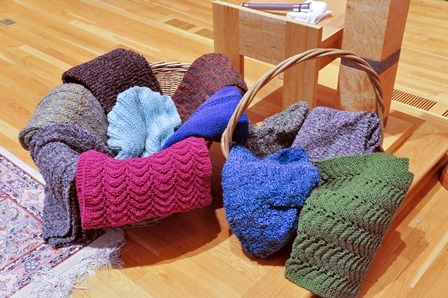 Prayer Shawl Ministry – Knitters and crocheters create prayer shawls to be given to others to show God’s care.